The only name worse than Texas Caviar is every other name I tried to come up with as a replacement for what amounts to a spicy bean salad. (Is this even from Texas?) This is a dip we’ve made for about 15 years, and it’s one of those recipes I got from my sister in-law, who got it from her friend, who got it from her aunt, who one time had it at a church potluck. I bring it to school functions since it’s temperature friendly, doubles easily, and feeds a crowd inexpensively. It’s pretty great for church potlucks, too. The beauty about this salad is its flexibility. 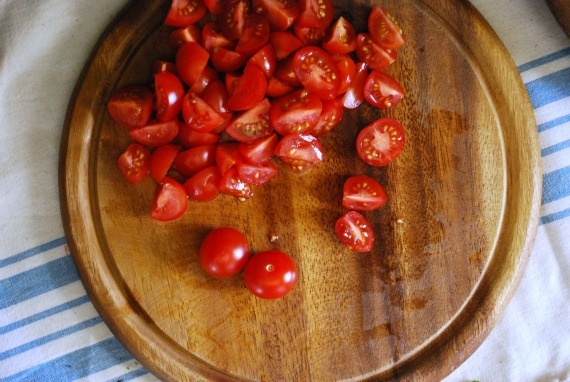 You adjust the ingredients to highlight your favorites, and the salad dressing is a base you then season to your taste. 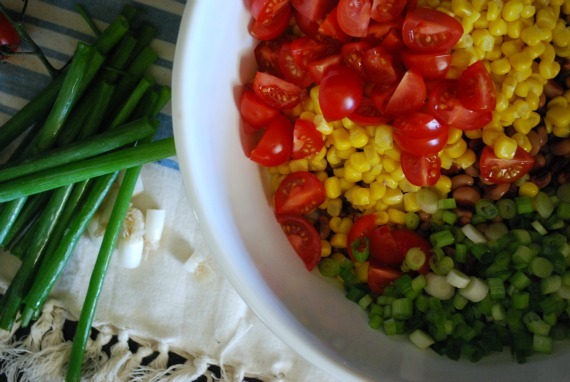 Mix equal parts black-eyed peas and corn (I’ve tried both canned and raw corn, with raw corn adding a nice crunch), some tomatoes, and finely sliced green onions. 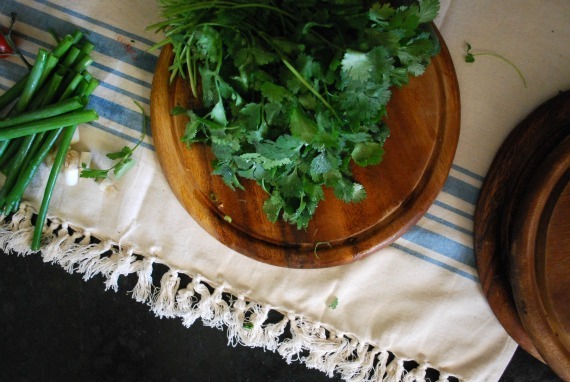 Finely chop some cilantro. Or don’t. It’s up to you. I love cilantro. Make your dressing and toss. If you want your dressing to marinate and come together a bit longer, make it first and let it sit in the refrigerator for a few hours or overnight. When you’re ready, put together your salad and toss gently. If you are going to serve it right away, add three chopped avocados and toss gently again. If you are like me and plan to make this salad your lunch for a few days, leave the avocados out. You can add a few slices of fresh avocado with each serving or, even better, slice an avocado in half and spoon the Texas Caviar into the hole–like I did here. You’ll get cool avocado with each spicy bite. You can eat it with chips as a dip, or as a salad. It’s also great for vegetarian tacos. It’s gluten-free, nut-free, dairy-free, and vegan. 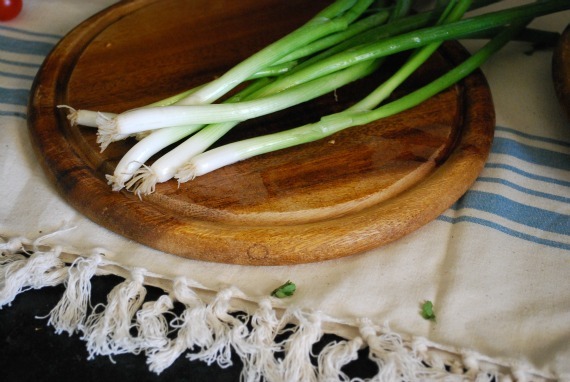 You don’t have to turn on a hot oven or stove and it even manages to taste good both cold and at room temperature. There aren’t too many people it can offend at the dinner table! Overall, Texas Caviar is a pretty good side-dish/dip/salad/entree/snack. Even if it does have a silly name. Begin by mixing all the dressing ingredients–a small jar is perfect for this. Allow the flavors to marry in the refrigerator for a couple of hours or overnight. If you are using canned beans and corn, rinse, drain, and empty both cans into a large serving bowl. 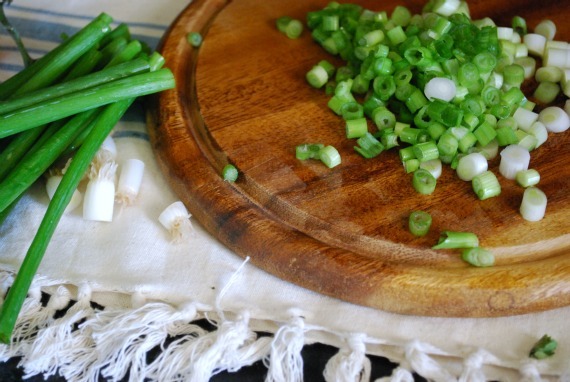 Add your chopped tomatoes, green onions, and cilantro. Toss gently with dressing. 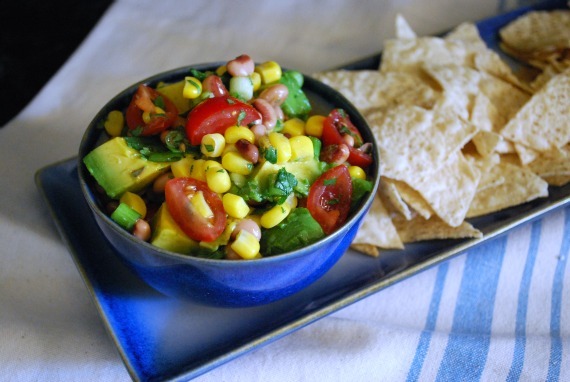 Add avocados if you are going to serve the dip right away and toss gently again. The avocados will turn brown or break down over time, so if you are going to nibble at this over a couple of days as a bean salad lunch as I do, add the avocados right before eating. Serves 10-20 as a dip, or makes 4.5 one-cup servings. 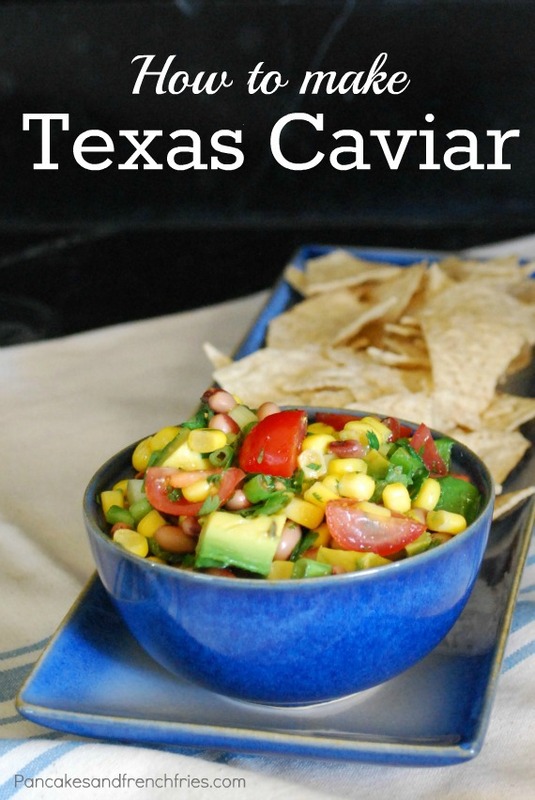 I actually kind of like the name Texas Caviar! I made something similar last month, but I think the recipe was titled Southwestern Black Bean Salad…Texas Caviar rolls off the tongue a bit more easily! This looks delicious, and I love the idea of serving it in an avocado half! Like Texas Caviar much more than my name for a similar salad: black bean salad that my husband won’t kiss me after. This salad, or something close, was my go to in my trying to be thin-thin-thin marathon running days. Beans make it so filling and the avocado makes it satiating. Yum. And good for you. The beans really are filling! I could probably cut out the oil since I’m using avocados, too. Hmmm. It looks delicious! 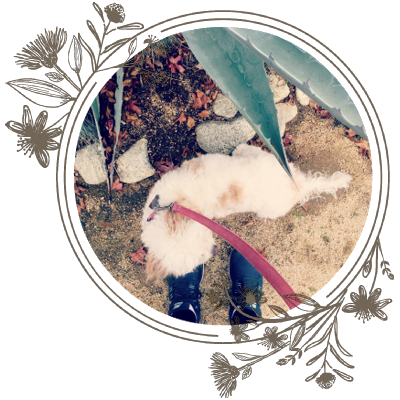 Your photos are amazing too!! 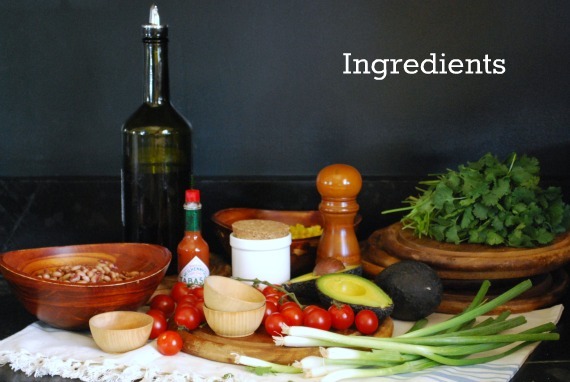 The ingredient photo looks like a set up worthy of the best still-life artist. Well-done! I’ve made a simplified version of that before, but I’m definitely making it with the avocado. I love those recipes that get passed around by word of mouth. About a year ago, you could tell who had been given a particular sausage bake recipe by the ingredients in their supermarket shopping basket- everybody in 3 villages was making it. Our tried and tested family recipe with a less convoluted history but a similar naming process is Hammersmith Pasta. Yep, catchy, eh? When I was a student I had an attachment in a nursery in Hammersmith, London. I knew children where I came from were fed macaroni cheese and fish fingers. These children were eating pasta with tuna, sweetcorn, onion and garam masala. I know, garam masala and pasta?? Completely wrong. But it smelt delicious and was made out of ingredients that I could keep in my room instead of being nicked from the communal fridge, so I went home and made my version of it. It’s still a regular stand-by in my house, I’ve made it with beans instead of tuna and I’ve never met a child who didn’t like it. Actually, there was one but she only ate about 6 different foods and they had to be cooked by her mum, so she doesn’t count! And for some reason, it’s Hammersmith Pasta instead of Tuna Pasta, Spicy Pasta, or anything else sensible. That’s the way it goes with names! The most unlikely and least descriptive will stick. Kind of like Pancakes and French Fries. ;) Your pasta recipe sounds delicious! 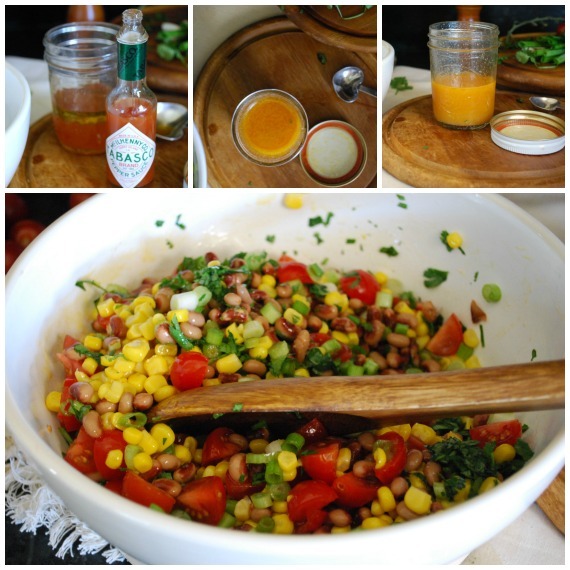 I remember my friend making something similar to this, and I think it was called Cowboy Caviar! Yup! I’ve heard it called cowboy caviar, too. Yum! I too, made something similar–with mangoes, black beans, a few more spices, and sans avocado. It was more of a groupie. Really, it didn’t stand well on its own . . . needed chips for dipping or something. But this–this I will have to try! Those old church potlucks, they had it going on . . . I was just thinking that some fresh fruit would taste amazing with the heat of the Tabasco/hot sauce! I agree, Texas Cavier sounds schmancy, not bad at all! My friend makes a version of this, and she also calls it Cowboy Caviar. It is awesome! I want to try your version. It looks light and refreshing for summer. This looks heavenly; great photos! It was first made by Helen Corbett who was from New York but had moved to Texas.